Lowcountry culture is rich with reminders of the past. Our collective and individual past and present are all around us in historic markers, environmental preservation and beauty. As a community, we often nurture what was left behind as we try to make our present more meaningful. With this pervasive philosophy wafting through our world like the ocean breeze, no wonder thrift stores thrive here. “Thrifting” fits our culture. Add in the charitable angle, and people have a cause to shop. Since Native American and freed slaves discovered this piece of paradise, residents haven’t stopped discovering its treasures. Locals and guests are now treasure hunting at thrift stores, digging through someone else’s items of the past to honor the recycled, reused and recovered. David Leininger, a retired preacher and self-proclaimed thrifter, said he has bought several high-end suits from thrift shops and loves to brag about his finds. “After losing 80 pounds, I was asked to perform a wedding on Hilton Head Island. After donating all my ‘fat’ clothes to thrift stores, I went back to them to find a suit. My Barney’s suit, which doesn’t sell for less than $3,000 in New York, cost me eight dollars,” he said. “We have wonderful junk here. We live in a fairly high-end community so when someone discards their old stuff, they are usually discarding high-end stuff. Since people outlive other people, we always have a supply of really good stuff,” Leininger continued. Thrift store volunteers and employees also say many feel good about their shopping experience because they are finding bargains while helping a cause, charity or civic organization. Bluffton’s oldest thrift store, Calhoun Station, started in 1989 by a group of Bluffton women who wanted to donate money to a low-income resident who lived off-island. Its first location was an abandoned gas station on Calhoun Street, and the name was born. Now, 22 years later, the proceeds from the store have raised more than $1.5 million dollars for nearly 30 different non-profits in the area. The granddaddy of the local thrift industry, The Bargain Box, started in 1965 with three ladies from First Presbyterian Church of Hilton Head Island. While The Bargain Box is its own separate entity from the church, the mission of assisting the region’s needy has taken on a life of its own. “From 1965 to 2010, The Bargain Box has awarded more than $11.5 million worth of grants to nearly every social and charitable organization in the Lowcountry. We have also partnered with other organizations and given away nearly $500,000 worth of our items to people recovering from illness, house fires and other sorts of distress,” Dean Roberts, office manager of The Bargain Box, said. The local thrift store industry represents how businesses can prosper in a win-win-win situation. As people downsize, clear their clutter or renovate, they receive tax deductions for their donations. Non-profit organizations have a constant revenue source to fund their causes. Thirdly, treasure hunters can find unique, often long-sought-after items that seem to appear at the right moment for a fraction of retail prices. Bobbi Helton, manager of The Litter Box, recalls one story of a retired man who had wanted a rosewood dining room table since he was in college. He walked in the store one day and was shocked to see a rosewood dining room table. Helton said he couldn’t get over the fact that the table was just sitting there, almost as if it was waiting for him to come in and claim it. Employees of area thrift stores have stories to share about a customer, or an item or how the store revenues really helped the charity during a tough time. The Palmetto Animal League’s most consistent revenue source, especially during the recent recession, helped them maintain its services while building a new adoption center with a strict budget and few employees. “During 2008-2009, the revenue from Animal House Thrift supported our entire foster program with medical care being the biggest chuck of our expenses,” Amy Campanini, executive director of the Palmetto Animal League, said. “We were able to focus on building our new adoption center while our thrift store maintained our current programs to shelter and foster animals. 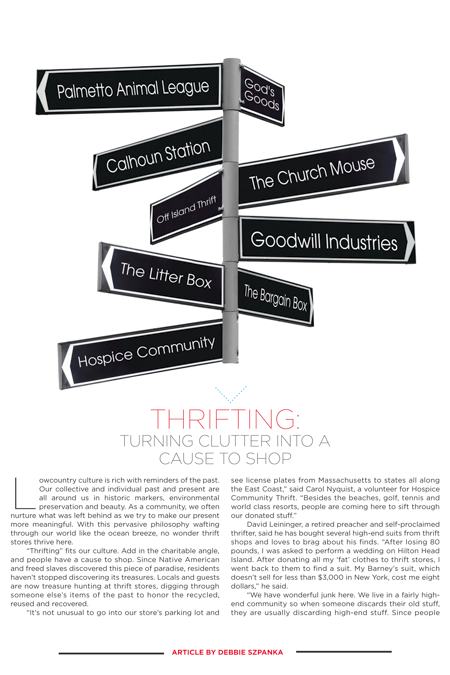 “Donating to our thrift stores also gives supporters a way to be involved in our cause of saving animals. Sometimes people can’t walk dogs; sometimes people can’t write a check; however, most times, people can clean a closet and donate items or help us by shopping in our store,” Campanini said. God’s Goods, one of the newest thrift stores in the area, just celebrated its first year of operation and its manager echoes the sentiment that everyone involved benefits from thrifting. Kim Perri is referred to as a “ministry leader” since the thrift store benefits the missions, ministries and outreach programs for The Church of the Cross in Bluffton. The Church Mouse is also a fundraising ministry of its parent church, St. Luke’s of Hilton Head Island. Phyllis Neville, its shop manager, said the store also does its best to honor and worship Mother Earth. Every store has its own story about why it was opened. Karen Matthews said she was motivated to open a store (Off Island Thrift) after she watched her father suffer from cancer. Realizing that cancer treatments consume so many parts of a person’s life, she wanted to ease the process for others. Despite the increased competition and the repressed economy, more area thrift stores are opening and expanding with no signs of the trend slowing. One of the area’s largest, Off Island Thrift, is about to expand its empire. Matthews has recently added more stores and is shifting her inventory so shoppers have specialty stores within her organization. She just took over the Stone Works building in Bluffton off of Bluffton Parkway. That store, to be named Off Island Thrift Furniture Showcase, will feature housewares and furniture. The current store off of Bluffton Parkway will be renamed Off Island Designer Clothing and Accessories, and the 20,000-square-foot building in Plantation Parkway will remain Off Island Thrift. Matthews refers to her success and expansion in words from the Bible. “We are pressed down, shaken together and running over,” she said. A major thrift store presence in the Lowcountry and the nation is Goodwill Industries International, with a 25,000-square-foot store in Bluffton, a 15,000-square-foot store in Beaufort and an estimated 3,000-square foot store on Hilton Head Island. The non-profit and its store work together to get people back to work. Its mission is to “enhance the dignity and quality of life of individuals, families and communities as they help people in need reach their fullest potential through the power of work.” Many Goodwill job-training centers are located in the stores, so job seekers can apply for jobs, work on their résumés and even buy work clothes in the same location. According to Erin Burneyko, a spokeswoman from Goodwill Industries of Lower South Carolina, more than 90 percent of all thrift store revenue is used to support Goodwill’s mission. In Coastal South Carolina, which covers Beaufort and 17 other counties, its 2010 revenue translated into assisting more than 22,000 with employment and placing 478 people into new jobs which lasted three months or more. In every thrift store, it’s the connections with the causes, the people and the past and how they go forward into the future that makes thrifting such a spirited sport and a meaningful shopping experience. Carol Nyquist, a volunteer with Hospice Community Thrift reminisces about how this year’s dollhouse project captured the rich spirit of giving and receiving someone’s past treasures. “A local gentleman donated a 14-room dollhouse to us before he moved to an assisted living center,” she said. “I spent six months repainting, reroofing, re-wallpapering, re-wiring and renovating it. It had a certain magic to it since the man and his wife, who was dying of cancer, built it together in 1978. “He even donated a shoebox full of furniture for the dollhouse. One of the rooms was a replica of their bedroom. Another room had a real brick fireplace with bookcases with tiny, tiny books. It was just beautiful,” Nyquist added. A woman in her 80s was thrilled to buy it, saying she had been looking for a dollhouse for five years. The new owner said she would send a picture of the dollhouse in her house when she gets it set up for the holidays. Nyquist will add that picture to a photo album showing the transformation of the dollhouse, which she will then send to the gentleman who donated the house so he knows his treasures live on.